Up to 28% Off Online Bookings at Gulliver's Theme Parks Book at least two days in advance! £29 Off LEGOLAND Annual Pass at LEGOLAND Windsor - Don't Miss Out! At Gulliver’s Theme Parks, their main aim is to provide magic for children and families and they have been doing just that for over thirty-five years. They are a year-round attraction with many of their rides and activities under cover so that you can still have fun, no matter what the weather at their theme parks based in Warrington, Matlock Bath, and Milton Keynes. 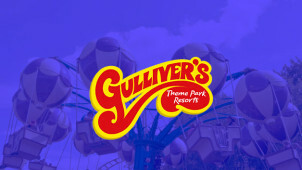 With your Gulliver’s World theme park discount code, you can take your little ones to enjoy a variety of different rides, including the Antelope Wooden Coaster, Gulliver’s Railroad, Junior Dino Cavalcade, Jumping Star, Dodgems, Crazy Barrel Ride, Carousel, Pirate Cove, and many more providing the whole family with hours of fun together and lifelong happy memories. Along with this, if you’re hoping to do some gift shopping for Christmas or a birthday, Gulliver’s Theme Park’s Shop has a massive range of toys from princesses and elves to pirates, NERFs, and giant sweets. Whether you’re looking for a cuddly teddy or a tactical vest for a NERF enthusiast, you’re sure to find the perfect gift in the shop at Gulliver’s World. How do I use my Gulliver’s World promotional code? Choose the discount voucher that you’d like to use, and click on ‘Your Deal’ to either receive a code or a printable promotional code if one is required to claim the deal. You will be informed at this point if you will need to print the code. Print your code, write it down, or save it in your smartphone. If you’re buying tickets on the Gulliver’s Theme Parks website, enter your code into the ‘promotional code’ box. Once applied, your discount will be visible. If you’re purchasing tickets on the day from the box office at Gulliver’s World, you should take your vouchercloud code along with you and let the cashier know before you book. If you’re planning to take your kids for some family fun at Gulliver’s World regularly or simply want to be able to spontaneously visit even if money is tight, an Annual Passport could be the perfect solution. Simply look for your deal and get your Gulliver’s Theme Parks annual passport for just £79. And, when you renew your passport after twelve months, you’ll save £10. When does Gulliver's World open? Gulliver’s Theme Parks are open at varying times of the year. During the summer, they are usually open in the week, however, if you’re visiting during the colder times of the year then you’ll need to check if they’re open as it is mainly weekend openings during off-peak times. You can check this at their website here. Is car parking free at Gulliver’s World? Yes! Free car and coach parking is available in front of the park main entrance at all of the Gulliver’s Theme Parks. If you hold a Disability Blue Badge, there is limited car parking available. Please let one of the friendly advisors know if you need to find a Blue Badge space. Some rides at Gulliver’s World are subject to height and age restrictions. Find out more on their website. Alternatively, contact via their online form here. Advised last admission is 1.5 hours before closing time. If you are looking for a fun day out that won't break the bank this year, then look no further than Gulliver’s Theme Parks. Based in Warrington, Milton Keynes and Matlock Bath, each park has rides, attractions and shows to fill your day with plenty of activities. Use your Gulliver’s World discount codes to get a better deal on entry prices, and enjoy an action-packed fun and adventures at the Star Studios, NERF Zones, and Splash Zones as well as the Theme Park for less! Gulliver’s Theme Parks are a great day out any day of the year, but be sure to visit when a little one has a birthday, as birthday parties are just one of the many things that they have on offer. Thanks to their various themed areas, Gulliver’s World is the perfect venue for a special birthday party for a little one, no matter what type of party they’d prefer. You can be sure that you’re in best hands as they host thousands of themed birthday parties every year. If you're planning to upgrade your weekend trips this year - Gulliver's Theme Park is a perfect family mini-break. Browse their selection of great value 'Stay and Play' packages for a budget weekend away the kids will love. Our Gulliver's World vouchers extend beyond savings on tickets and can even help you claim hotel discounts too. Start planning your trip today, and keep it cheap with vouchercloud.